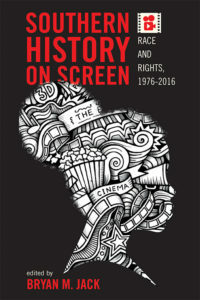 Associate Professor of Historical Studies, Dr. Bryan M. Jack, whose area of specialty encompasses African American history and the American South, recently edited and published a book entitled, Southern History on Screen: Race and Rights, 1976-2016. The book is the first of its kind, using race as a primary lens for viewing critical perspectives on Hollywood’s relationships between historical films, Southern history, identity, and the portrayal of Jim Crow–era segregation. The book is an eclectic collection of topics with each chapter standing alone but also forming a chronological volume. Some chapters are personal and told through a familial experience while others take on more of an academic approach. Along with editing the collection, Jack also contributed a chapter on Civil War films that do not depict slavery. “The absence of slavery in these films really says something,” said Jack. On Apr. 25 at 4:00 p.m., Jack and Alexander will be at the Cougar Store in the Morris University Center to talk about the book.